A boy searches for his newfound love among the city streets, to find that, unwarily, she's been caught in the arms of an evil street lord who means her harm. It is only through perseverance and undying love that the girl is returned to the safety of her one true love. Lyrical text and stunning mixed media artwork make for a powerful recasting of the classic ballet Swan Lake. He touched her waist; she kissed his cheek. Her eyes began to tease. Set among the asphalt of a housing project and the concrete of a basketball court, Walter Dean Myers' compelling work is delivered with rhythms that twist, hover, pounce, and inspire. For Amiri and Odette, love is hard when the streets are mean. Their dance for two becomes a fight for three, and their only chance is to hold fast to the power of being together as one. Part poem, part love story, part rap and rhapsody, AMIRI AND ODETTE: A DANCE FOR TWO celebrates hearts that beat forever. Accompanied by the collage-on-cinder-block paintings of Javaka Steptoe, this genre-breaking volume sets a new stage for a classic story. Walter Dean Myers is the 2012 - 2013 National Ambassador for Young People's Literature. He is the critically acclaimed New York Times bestselling author an award-winning body of work which includes, SOMEWHERE IN THE DARKNESS, SLAM!, and MONSTER. Mr. Myers has received two Newbery Honor medals, five Coretta Scott King Author Awards, and three National Book Award Finalists citations. In addition, he is the winner of the first Michael L. Printz Award. He lives in Jersey City, New Jersey. 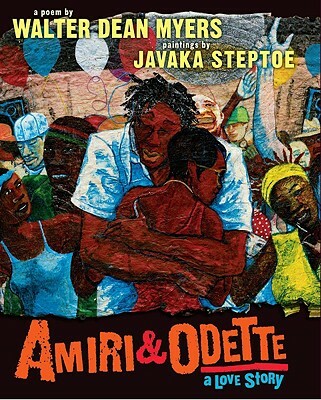 Javaka Steptoe is the award-winning artist of many books for young people, an NAACP Image Awards nominee, and winner of the Coretta Scott King Illustrator Award. He is also the artist of the highly acclaimed books DO YOU KNOW WHAT I'LL DO by Charlotte Zolotow and A POCKETFUL OF POEMS by Nikki Grimes. Son of the late award-winning author/artist John Steptoe, Javaka draws inspiration from the multifaceted colors and shapes of Brooklyn, NY, where he lives and works.